Learn: How to sending data through HttpRequest and get it back on webpage without refreshing the page. 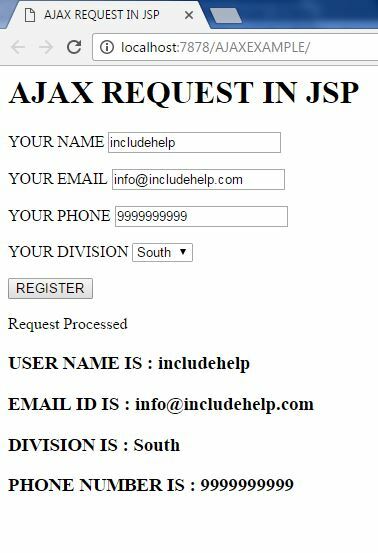 AJAX is an Asynchronous Request which is mostly used in different websites to load the content without refreshing the whole page. For example, you can see the cricinfo, it will automatically update dynamically without any refreshing the page, the request to the server is sent without any reload. Here, we are taking the inputs from user and sending them to server request by creating HttpRequest object. Soon as the user clicks on register button the request is sent and response is returned back. In the index.jsp if you clearly observe we are sending the input values to ajax.jsp. So at there we took the parameter values and displayed them. 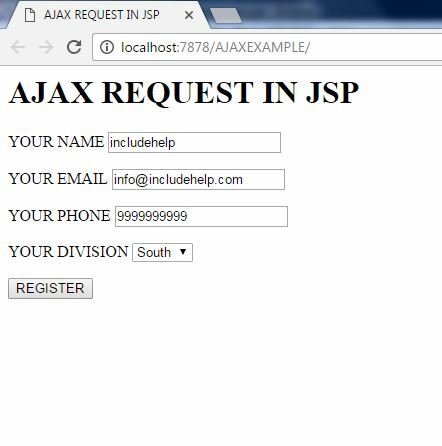 Note: For much more clarity just read on to our tutorial of COMMENT BOX DESIGN USING AJAX IN JSP.